Life -- and summer (winter, if you're a Downunder reader) -- is short. Don't waste a moment or a calorie on a bad mojito. Homemade mojitos require foresight and preparation. But sometimes (or often, if you're me) the craving for a mojito exists even though the pre-planning didn't. Enter three mixers. And my thumbs. 1. My favorite mojito mixer is by the same folks who make flavors for coffees -- the good people at Monin. This product offers the perfect type (spearmint, NOT peppermint) and intensity of mint, with just the right texture (only mildly sweet and not too syrupy). Exactly what I aim for when I make my own simple syrup. Thumbs Up for taste and texture. You still add the soda, the rum, and the lime, so it's very close to homemade. Thumbs Down for availability. Locally, I can find this only at a coffee wholesale warehouse in a section of town I rarely get to. So I tend to stock up twice or thrice (how often does a blogger get to use that word?) a year. However, thanks to having to write this post, I found it through the Amazon marketplace, with a better price, $9 a bottle. 2. A passable choice is Freshies, a company perhaps more famous for its Bloody Mary mix. This concoction has both the mint and the lime flavors, so you need only add rum and soda. Thumbs Up for convenience. No need to cut and squeeze the lime. 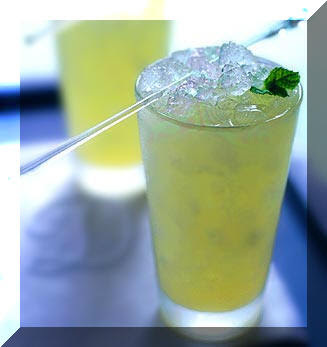 When you're making a batch of drinks, the lime step can keep you from your company for a seemingly long time. Thumbs Even for taste. 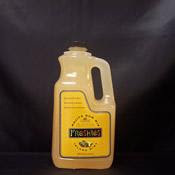 Despite it's name it just doesn't taste as fresh as Monin or as homemade. Fresh limes really DO make a difference. And if you add them to Freshies, it's just too limey. Thumbs Down for price. Online, the price for a bottle is $10.50, but you can often find this product at your local supermarket or specialty grocer for less . However, the recipe on the bottle calls for 3 times as much mixer as the Monin, making it a more expensive option. 3. Here's where I derived the title of this post. But first, a digression. Back in a high school genetics class, we studied traits that we'd inherited from our biological parents. I remember studying such quirks as hitchhiker's thumb, hairy knuckles (neither of which I had), and the ability to taste a certain chemical. The teacher passed out to each student a piece of tissue paper that had been infused with a substance detectable only to people with a certain gene. The tissue paper was completely benign to some and absolutely repulsive to others. I had flashbacks to that experiment both times I had a mojito made with Rose's Mojito Mix. So I can only give it a thumbs down. It's watery, it requires that you use a lot, and it tastes like science class. If you are lacking that gene and really LIKE mojitos made with Rose's, let me know. I'd like to check out your knuckles, as well. Enough talk. Time to drink! * Heat equal parts sugar and water (say, 1 cup each) in saucepan until just before boiling and stir until sugar is completely dissolved. Add 1/4 cup fresh, chopped spearmint leaves and let steep 30 minutes. Use a strainer to take out mint leaves (discard), and keep minty syrup in sealed container in fridge for your Mojito Moments. How long can you keep the simple syrup in the fridge? The recipe says the syrup will keep a week in the fridge. But I have some that's been in there a month, and I'm still using it. yummmm! I've been waiting for you to post your recipe. I didn't realize you make the syrup minty! yum. and thanks for the mixer tips. I like "nojitos" too, especially on a super hot day. OMG, I don't know why I never thought of a virgin mojito! This could be my new best friend for the rest of the summer. Have you tried Tipsy's for mixers? I haven't looked there, but they are supposed to have a wide variety. Gonna check out Tipsy's megastore. Alllll in the name of research, right? mmmm....I love mojitos. I was getting a little worried that you weren't going to post your recipe for simple syrup. So glad you did! Sounds perfect for a bbq we're going to tomorrow night! I'm another one that never gave a virgin mojito much thought - well, I thought of it, but just never bothered trying to make one. But since spearmint is taking over my garden and I am always looking for nice virgin drinks, I will certainly give your syrup recipe a try. 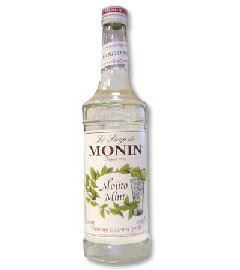 I will also look out for the Monin syrup - I love their other flavours but didn't know they made spearmint. Thanks, Lori! Being a gluten free gal, I'm always looking for good refreshing alcoholic drinks during the summer that don't involve beer. I've been playing around with mojito recipes. I'll have to try the syrup, but I'll probably only do homemade as most mixers have high fructose corn syrup which is just plain evil. I did notice that Whole Foods does have some mixers that don't have HFCS, but I haven't looked for mojito mix. I figure homemade is always better. Plus, I'd rather use agave nectar than sugar. I did try making mojitos with dark rum. I didn't like it as much, though my guests did. If you are looking for a great summer drink and can have Corona or the like, make a "chelada". This is a Mexican drink. Fill a glass with crushed ice. Add about 2 Tbsp of lemon juice. Then pour in Corona or favorite Mexican beer. Heavenly on a hot summer evening! Very comprehensive. Would like to be part of this taste-testing crowd!! I need your help. I have to serve about 600 virgin mojito drinks, how many bottles of the Monin would you recommend I have on hand? Eddie -- You'll need about an ounce of Monin for each mojito, maybe a bit more if they're virgin. Let's say 1.5 oz. There are about 25 oz in a 750 ml bottle. You need 900 oz total. You should have 36 bottles minimum. More to be safe. Hope this is helpful! We'd love it if you buy the Monin from our Amazon store. It's a good price and you don't have to spend any gas or time going out to get it. I'm wondering if anyone has tried the Stirrings mixer? It appeals to me because it's make with sugar, instead of high fructose corn syrup. But I don't want to spend the money on it if it is crap. Any volunteers to try it? Yes! That's a good one, too. Taste-wise, not as good as the Monin but right there in 2nd place. Thanks for mentioning. I'm really trying to avoid HFCS. That science class memory of yours is PTC paper (phenylthiocarbimide). I can't taste it myself, but I do get a lot of entertainment from the facial expressions of my introductory biology lab students who can!! I see it's available on Amazon... Just in case you want to do a formal comparison with mixer #3!! Another who is thrilled by the idea of a virgin mojito! Oh, I can't wait to order one in a trendy bar/restaurant soon! Oops, just realized this was an old post. Oh, well. Still can't wait to order one!